I met Beatrix years ago, when she was working on her series, Member’s Only, a study of private clubs. I loved that work, a really interesting view into the intimate and very private gathering spaces found all over the world. Beatrix is smart, open and full of life. It is this zest and wonder for life that always makes her projects and images interesting and insightful. When I saw her in Portland, 20 minutes just wasn’t enough time. Catching up on everything she is working on, and the travel schedule she keeps, I needed a program. She is a dervish, illuminating our world though her work. The new series, on the Varanassi, part five of a broad series on modes of “strengthening” continues to give us an insiders look at unique ways of conditioning and strengthening bodies and souls. 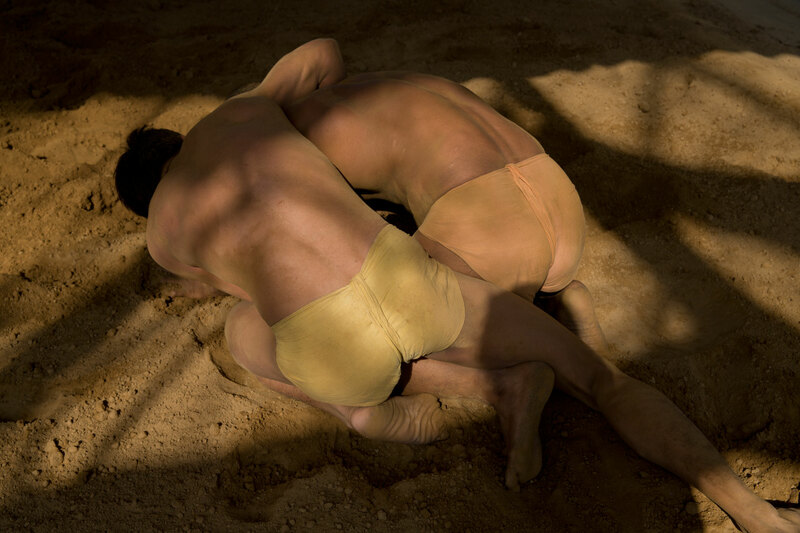 The fifth chapter “Varanasi” (in-progress) investigates Indian mud wrestling or mitti kushti. Wrestling in India, and particularly in Varanasi, goes back to ancient times. A certain form of wrestling was practiced before the one brought by the Mughals in the eleventh century: Bharatiya kushti (Indian wrestling) or simply kushti, as it is called. In this country where religion impregnates each act of everyday life, kushti has blurred the religious borders, just as music has done. Even though the Mughals brought it as a strong print of their identity, Hindus adapted to it by introducing religious rituals into it and dedicating the sport to the deities of their pantheon. Indian wrestling is also a way of ascetic living, implying not only intensive physical training, but also a code of ethics, personal hygiene and specific diet, celibacy, sexual abstinence, devotion, discipline and a multitude of other moral values. This unique sport requires a balancing of the body and spirit ~ it is a worship offered to the deepest human values, to the world of gods, to an ideal. Kushti, has something to do with the search of the ideal, a harmony between human beings and gods. The daily training takes place in an arena called akhara. A guruji directs an akhara, dictates its rules. He is the backbone of the place. He defines the objectives and sanctions if they are needed. In addition to his role as coach, he is the leader of theakhara. Beatrix Reinhardt grew up in Jena, Germany. After the completion of her undergraduate studies in New German Literature at the Freie Universität Berlin she planned to study at the New School for Social Research in New York for one year. The one year became two and Reinhardt graduated with M.A. in Media Studies. During her studies at the New School she started her studies of photography, which she continued at Illinois State University. Since the completion of a Master of Fine Arts degree, Reinhardt has been living, working and teaching in different parts of the world. She has been invited as artist-in-residence to universities and galleries in Finland, India, Australia, China and the US, amongst others. Presently she resides in NYC and is an associate professor at the City University of New York/CUNY. Reinhardt’s work has been exhibited in Europe, North America, Africa, Australia and Asia. Awards received include individual artist fellowships and artist’s project grants from the CUNY Research Foundation, John Anson Kitteredge Foundation, Australian National University and other non-for-profit arts organizations and residency programs. She was a winner of the Flash Forward 2007 award given by the Magenta Foundation in Toronto Canada. Her work was featured in a variety of publications including Die Zeit (Germany),Contact Sheet (USA), Prefix Photo (Canada), Flash Forward 2007 Book (Magenta Foundation), the photoMagazine (Germany) among others. Her work is included in a number of corporate, museum, private and university collections across the United States and abroad including the New York City Public Library, California Museum of Photography, Center of Photography at Woodstock, Light Work collection, Old Parliament House in Canberra/Australia and Rural Documentary Collection in Illinois. Reinhardt has been curating as well. She was invited by Bruce Silverstein Gallery to be one of the curators for “Silverstein Photography Annual” in 2010, among others. To see more of Beatrix’s work, please log onto her website.